MaineDOT: Notice of Formal Public D'OH! 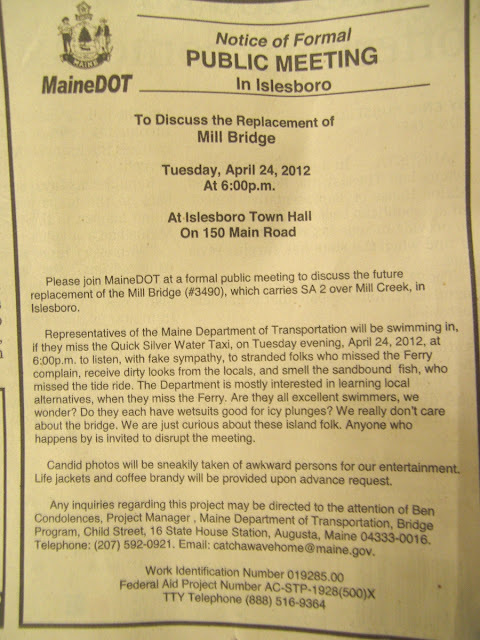 When the MaineDOT (Maine Department of Transportation) formally invited Islesboro residents to join them for a discussion about the Mill Bridge, they also formally insulted them. In a "Notice of Formal Public Meeting" published on page A2 of Wednesday's Bangor Daily News, MaineDOT wrote, "We really don't care about the bridge. We are just curious about these island folk." They also mentioned that their representatives would listen "with fake sympathy, receive dirty looks from the locals," and that photos of "awkward persons" would be sneakily taken for their entertainment. The spoof draft was not meant to be seen by the public, but due to an apparent mix up, it was. D'OH! See the notice in its entirety below.